Shape is a weight management solution, comprising of a range of great tasting high protein low carb shakes. 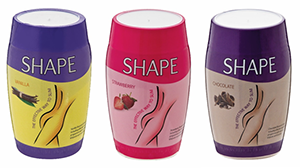 Shape is formulated to assist you throughout your weight loss journey to a better looking and more confident you. Recent trends have shown that high protein low carbohydrate diets, result in more effective weight-loss if combined with an exercise program. The Shape diet program should result in steady and realistic weight loss without hunger pangs and listlessness.